DesignEvo is a free, online logo maker that is quick and easy to use. If you are a blogger or business owner, having a sharp looking logo can go a long way. Let's take blogging for instance. It's beneficial to have an easy to access file on your computer or device that you can easily upload while interacting online. Whether it's posting to a forum or communicating back and forth through email, adding a fresh, clean logo to your signature will get your name out there and help folks remember who you are. Images are powerful, as we obviously see in advertising, so if you have a simple image to coincide with your company/blog name, people are more apt to remember it. As bloggers, we have enough on our plate as it is. So trying to find a free image online that would work within the confines of a logo for our blog can be tedious. The site is easy to use and has piles of customizable images that you can work with. Simply type in what you are looking for in the search bar or browse through different categories such as abstract, childcare and education or animal and pet. Once you settle on the design you like best, go ahead and type in your logo name and slogan if you'd like. Below is the logo that I created in minutes that has a paper airplane and my blog name. Cute, isn't it? Instead of scouring the internet for the perfect image, this site provided me with plenty of options that would meet my needs. Ready to make a logo of your own? Head over to DesignEvo and get started! 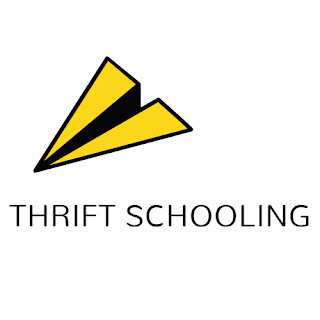 Our friends over at DesignEvo have graciously agreed to provide one Thrift Schooling reader with a product of their choice from their store on a sister site, Pearl Mountain! The winner has a variety of options to choose from either Mac or PC friendly. You can choose from the Greeting Card Creator, Video Gif maker, a Publishing Tool, Collage Maker and more! The greeting card maker looks great! I can’t find the designevo on their website, but that grabbed my interest. For the items listed, I’d use the windows edition of any of them. Picture Collage Maker Pro looks like a good program.